Millions of guests visit Walt Disney World yearly and often pass right by some really great characters. This list should help you find some that others would miss. 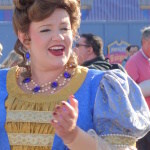 Most people visiting the Magic Kingdom are in a huge hurry to get to Peter Pan’s Flight, Enchanted Tales with Belle, Space Mountain, get a Cinnamon Roll at Gaston’s Tavern or meet Merida, that they don’t even realize that the Main Street Citizens are a part of the experience that is the Magic Kingdom. The citizens live in a specific point in time in which local politics that included the women’s suffrage movement. No one is a bigger advocate for women’s rights than Hildegard Olivia Harding! You can help put out a fire with Chief Smokey Miller, participate in an impromptu drama with Beatrice Starr, get some great shopping tips from Constance Purchase, help take a vocal lesson from Victoria Trumpetto and hear the Mayor Christopher George Weaver and Councilman Dewey Cheatem’s speeches. Scoop Sanderson even enjoys trading pins with guests. Don’t pass them by, they are a lot of fun. I list the schedule for this event on the Magic Kingdom Entertainment Schedule which is updated every Saturday night. Move it, Dance it, PLay it as it’s affectionately known among cast members is a great way to dance and interact with some of your favorite Disney and Pixar characters . There’s no where else on Walt Disney World property that you can dance with that many different characters while learning to Shake Your Groove Thing and Shake Your Tail Feather. I list the schedule for this event on the Magic Kingdom Entertainment Schedule which is updated every Saturday night. Like the Citizens of Main Street, most guests pass right by these talented performers on their way to the Tower of Terror, Toy Story Mania or Star Tours and don’t get to experience the great comedy show and even better interaction times that one can find. I located these guys in the Backlot area during Star Wars and we joked around for several minutes. They typically appear in Hollywood Studios from 10:30am to 6:00pm with a big performance at the Sorcerer’s Hat at 10:30am. 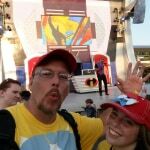 The Incredibles Super Dance Party is the only opportunity to see and dance with Mr and Mrs Incredible and Frozone. They no longer offer meet and greets, so boogie down with these classic Pixar characters. Here’s a quote from my experience at Chip n Dale’s Campfire Sing-a-long, “We had met the Chipmunks and tried to turn the Chicken Dance into the chipmunk dance, to no avail I may add. We then consumed our fat content and sat down to watch a movie.” The Campfire is held nightly (weather permitting) at Fort Wilderness and is FREE to anyone. You can bring your own smores and hotdogs or buy them there. It’s a fun way to interact with (Dance) Chip n Dale set to more of a country/western feel. Expect to do the Chicken Dance at least once! 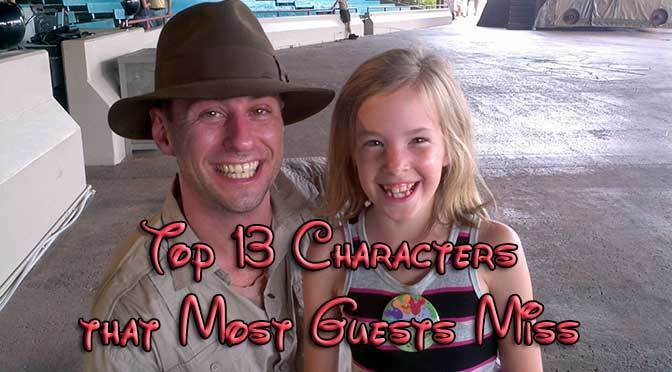 Many guests aren’t aware that some characters offer meet and greets in the Water Parks. You can meet Goofy at Blizzard Beach and Lilo and Stitch at Typhoon Lagoon. 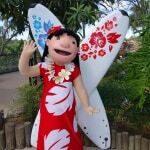 The only other way to meet Lilo is to book the ‘Ohana character breakfast. Drop in and hang ten! Divine is a pleasant distraction in your busy Animal Kingdom tour. She blends in so well with her environment, that she is really difficult to spot at times. She can be seen either in the Oasis area near the entrance or near Bradley Falls on the trail from Africa to Asia. Check the Animal Kingdom Entertainment Schedule to see when an where she’s appearing during your vacation week. In order to meet Mickey, Minnie, Goofy and/or Pluto at the Epcot Visa Character Meet, you must hold either a Disney Visa credit or debit card. You’ll receive one FREE photopass photo for each card you have in your possession. The meet area is located inside Innoventions in a pretty non-descript area. I recommend going later in the afternoon to avoid any wait. The schedule and location for this meet can be found HERE. The Royal Majesty Makers are a relatively new offering that appears in Fantasyland. They are a roving comedy troupe that may remind some of the Citizens of Main Street and Streetmosphere, but has a classic royal appeal. “Led by retired knight Sir Sterling and royal etiquette expert Lady Llewellyn, the Royal Majesty Makers also include squire extraordinaire Tobias and flirtatious lady-in-waiting Bridget. They may be found in the Castle Courtyard, conducting Knight School, delivering invitations to a royal ball, leading royal dances or even playing a game of “Sir Sterling Says.” I list the schedule for this event on the Magic Kingdom Entertainment Schedule which is updated every Saturday night. The Disney Jr. Dance Party is only available to those with Evening Extra Magic Hours privileges, so it’s even more limited than many character experiences. It takes place at Hollywood Studios in the Disney Jr show building during Evening EMH only. You’ll need to show your room key for entry. I list the schedule for this event on the Hollywood Studios Entertainment Schedules weekly. They use strobe lights and theatrical fog which can make for horrible photos from more than a couple feet away. Very few guests know about the Frontierland Hoedown because it isn’t listed in any official Disney publication or application. 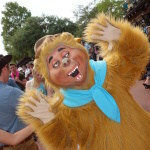 It provides you with an opportunity to interact with and often meet with some otherwise rare Disney characters like Brer Bear and Brer Rabbit, Clarabelle Cow and Horace Horsecollar and Big Al and Shaker. It’s a short song and dance time followed by a brief meet and greet period. Staying for meet and greets may vary by season and by character. I list the schedule for this event on the Magic Kingdom Entertainment Schedule which is updated every Saturday night. Character Palooza or “Pop up surprise” as some refer to it is a far better Disney secret than the Disney Vacation Club! Most guests have no clue it exists, where it is or when it is offered. 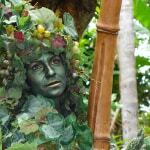 I created a committed page to the schedule that will help you know when to visit Character Palooza. Some of the rare characters that appear include Captain Hook, Mr. Smee, The Queen from Snow White, Queen of Hearts, Geppetto and Pinocchio. Be sure to schedule this into your next visit! Disney World has chosen to make this even harder to experience, but there’s some details HERE. VERY FEW guests realize that Indiana Jones often meets guests for a few moments following many Indiana Jones Epic Stunt Spectacular performances. I’ve met Indy a number of times and met Marion Ravenwood only once. Stay around after the show and head down to the lower right hand (looking at the stage) area of the stage. Wait until all the other guests have left to eat waffle cones and use their Star Tours Fastpasses and you might get to meet the great archaeologist. I list the schedule for this event on the Hollywood Studios Entertainment Schedules weekly. How many of these experiences have you seen or missed? Does #3 still happen? I hit the link button and it took me the magic kingdom page, but does not list the Hoedown. Hi. Is this an app in the Apple Store as well? Awesome, thanks for this info. Very helpful! Hi Kenny, Love your site! I was wondering if you’ve heard where the Visa M&G will be moving to since they’re closing Innoventions at the end of April. I had a great time when we checked it out for the 1st time in ’10 & I’m hoping it will continue! Thank you! 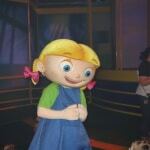 Could be moving to other Innoventions. We’ll know soon. thanks! i’ll keep an eye out for the info. 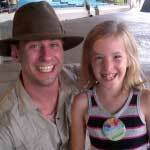 Is it possible to meet Indiana Jones without first watching the show? I guess I should reschedule my plan .. i currently have the 1:45 show on my plans.. it will be in November .. maybe I still have a chance to meet him. i was reading below some shows he does not meet afterwards/ better chances at first and last show….? He’s come out after every show I have attended except ones abbreviated by weather. Do they sign autographs after the hoedown or just pictures? Nobie, it depends. Sometimes they take a few minutes to pose or sign and other times they just skip away. A character experience (though not a meet-and-greet) that a lot of guests sleep through is the opening show at the Magic Kingdom. Hi Kenny! Do you know if the Disney Jr. Dance Party will be happening the last week of February 2014? Or the Hoedown? Is there anything else “special” going on that week that you know of character-wise? We are bringing my daughter there for her 6th birthday that week. SO EXCITED! Yes Disney Jr, Hoedown, Dinoland Dance Party, Incredibles Dance Party and Character Palooza should all be going on. The schedules are updated every Saturday night for the following week on my app. Hi! With the Disney Jr. dance party, what other characters can you meet? Sofia the First has taken the place of Little Einsteins, otherwise the experience is the same. 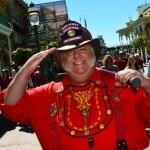 I wanted to add to your information about Streetmosphere at Hollywood Studios. The photo you posted is of the Hollywood Public Works, who are part of the Citizens of Hollywood performers. Hollywood Public Works can typically be seen behind Keystone Clothiers, in the shade. But twice a day they are down by Once Upon a Time. You can catch the Citizens of Hollywood on Sunset Blvd. Anywhere from Villains in Vogue to Once Upon a Time. You can also catch them on Hollywood Blvd. They have been ending their day with “Funniest Citizens of Hollywood” jokes at 3:00-3:20 in front of Villains in Vogue (not to be missed). Between the Citizens of Hollywood and the Hollywood Public Works you can be entertained without stop every 1/2 hour, Even though they have skits they do, they typically play off the crowd which is really fun. If you would like to see more photos of the Citizens of Hollywood or the Hollywood Public Works, you can check out the link to a facebook fan page. Do you have each group’s actual schedule? I’d love to include that info for their fans! Most of these I did know about except the Hoe Down at Frontierland. I’ll look for it next time I visit. And this is a reminder to me to hang out on Main Street longer. Lots going on there but it’s the mind set of everyone to just keep moving. I appreciate you listing the names of the Main Street performers too. My favorite place to be is Hollywood Studios. I will spend the entire day watching the Citizens of Hollywood. They are certainly not to be missed. They are the reason we keep coming back to Disney. And they are the reason my son is in the Disney College Program now. I’m slowly working on getting decent photos of all the Citizens of Hollywood to write about them more in the future too. We met Indy and Marion last Nov thanks to your advice! They took pictures and signed my son’s autograph book. And the best part was there were only about 5 people waiting. It was great! I love meeting with Indy because there’s almost always no one around. Push got really mad at my sister last year because she was tired and tried to sit on him. it was very funny to see. We encountered Push last year and my girls still talk about it! This year we did the MISICI parade and loved it! It’s on our must-do list now! Probably early or last show, he gets REALLY hot from performing, so he could need to leave to cool off and get some water and prep for the next show. Hey, I know this is a really late addition to this post, but just wanted to offer my experience. We were there in October and went to the first show thinking it would be cooler and maybe he would stick around, but no luck. We were sitting there at the waiting so long (we did get to see the sets get pushed back together which was cool) that the cast members were cleaning up around us and we finally just asked one if Indy would come out. She was so helpful, she said that the 2 Indys who had been in that show were newer, but she told us the 2 times to come back to when one of the regulars would be performing. She said she would even seat us in the VIP section if we came back, but since it was our only day in HS we didn’t want to watch the show again. So she said to sneak in the exit around when the plane is ‘exploding’ and then come down to the front at the end, which we did, and we got to meet Indy!! It was awesome, he was so nice, and we were able to find that particular cast member again and thank her. I think the show we ended up going to was around 4pm. We were approached by the Royal Majesty Makers at Spring Break. They were funny, and the experience was made funnier when a lady walked up to us and asked “Are you Characters?” Lady Lewellan didn’t quite know how to respond to that (she was trying not to come across too sarcastic), and gave us something to laugh about all week.